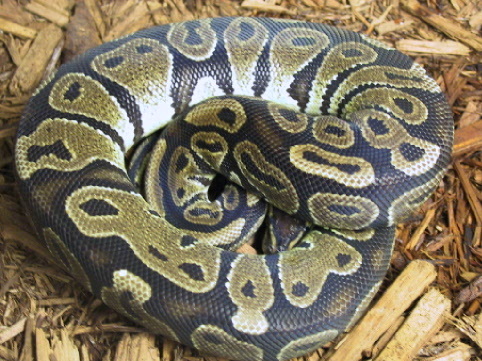 Ball pythons often serve as an introductory python. They are readily available, grow to a good size without being overwhelming, and generally have good dispositions. This is the upside to ball pythons. The downside is they arrive in this country in two conditions; great shape or horrible shape. They can also be problematic feeders. Fortunately, the ball python is now being bred in captivity offering potential snake keepers a shot at a healthy, less stressed and less parasitized animal. Always buy a juvenile snake. Captive bred is always preferred. They will make for a more docile pet and eat readily with no problems. Adult ball pythons, especially those which have been collected from the wild are notorious for being finicky eaters. Avoid these animals! Until recently there was simply the standard ball python. 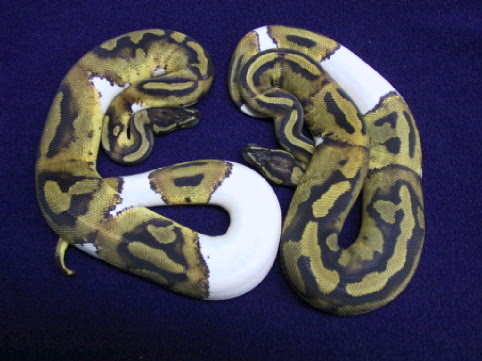 Through Selective breeding, Breeders have developed various colors and pattern variations (morphs). 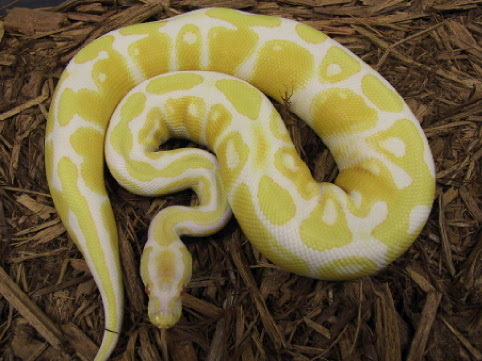 There are "albinos", jungle morphs, piebald and striped ball pythons. Naturally, these animals are not common, but they are available for a price. Thousands of Ball Pythons are Imported to the U.S. & Europe every year. Many Reptile Breeder today are producing more & more Captive Born Ball Pythons than ever before - providing the consumer with superior animals. NATIVE HABITAT: The Western and Central African Savannahs and plains of Ghana, Togo & Benin. Ball Pythons are found on the ground in burrows or dens of small mammals (most likely Pouched Rats ) and in Termite Mounds. SIZE: 3 - 6 feet. Average size is 4 feet. 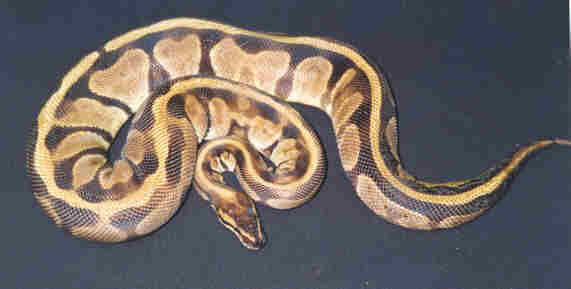 Ball pythons have a small head, with a long, thick body, and a short stubby tail. HOUSING: A thirty gallon aquarium (36"x 12"x 12" ) or a cage of equal size (i.e., Neodesha ABS plastic cage or melamine cage) is adequate for a full grown ball python. The cage must have a tight fitting secure cover. Screen covers are best secured with "cage clips." Cypress Mulch is a good substrate for Ball Pythons. The Mulch will help increase humidity. It is generally best to avoid pine shavings, corn cob bits and gravel. These substrates may be ingested by the snake. A large bowl of fresh water should always be provided. Not only is water used for drinking, but as an aid during shedding. Ball Pythons require a fairly humid environment to do well. Hide boxes must be provided to give the snake some privacy. The Hide Box should be placed directly above the heat source. A hide box may be bought at a local pet shop or you can make one out of a cardboard box. Snakes that do not have access to a hide box will often "stress out" and not Eat. TEMPERATURE & LIGHTING: 75° - 82° F is a comfortable ambient temperature for ball pythons. A slight drop at night of 5° -10° F is quite acceptable (simulating night time temperature drops). A thermometer should always be present so that you can monitor the air temperature. A “ Hot Spot “ of about one quarter the size of the Bottom of the Tank must be provided. It should be placed at one extreme end of the tank or unit. An “Under Tank “ Heat Pad or “Heat Tape”, controlled by a Thermostat, is a commonly used method of raising the temperature of this Hot Spot. The Temperature on this spot should be 87 – 90 degrees F. Always provide a "hot" area and a "cooler" area for the snake so that it may thermoregulate its body temperature. No special lighting required. Fluorescent bulbs are more cost effective and run cooler than incandescent bulbs, and you eliminate the possibility of thermal burns. Light should be on 10 - 12 hours daily. 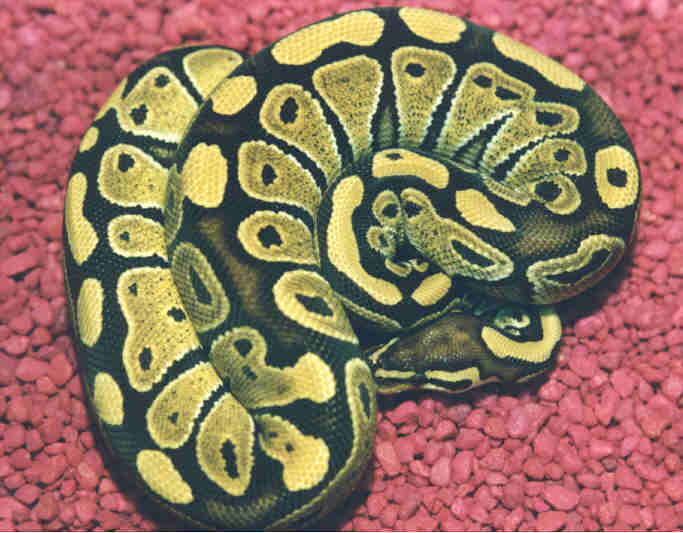 FEEDING: Ball pythons will feed on mice and small rats. Adult wild-collected ball pythons can be finicky eaters. To get these animals started as well as finicky juveniles you may have to resort to gerbils. Often a ball python that refused a mouse or rat will accept a gerbil or a mouse/rat scented with a gerbil. This may be done by rubbing the mouse/rat with a frozen gerbil (you can retain this gerbil for continual use). Known as "SCENTING". It is preferable that you get your snake eating freshly killed or thawed frozen mice or rats. You'll never have to worry about your snake getting bit by a dead mouse/rat. If you do feed live animals to your snake, make sure it eats it before you leave the room. HANDLING: Juvenile and captive bred specimens are always the easiest snake to handle. Work with these snakes so that they become accustomed to your touch and smell. Do not handle these snakes immediately after they have eaten, after you have handled mice or rats, and when they are shedding. PURCHASING: Always try to buy a captive bred animal. Handle the animal before buying it. It should move freely and easily. There should not be any scars, cuts or bumps. The eyes should be clear and bright. Do not buy a snake that is shedding. There should not be any mucus or bubbles from the mouth or nasal areas. Check for mites and ticks, especially on wild-collected snakes. If you have additional questions about ball pythons try to attend one of the LIHS monthly meetings. You can e-mail us at info@lihs.org or write or call the LIHS at the address/phone number at the top of this sheet. Reading about your snake before buying it is always beneficial.